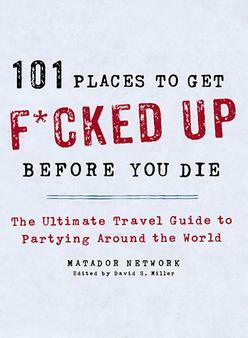 Part travel guide, part party invitation, part drunken social commentary, 101 Places to Get F*cked Up Before You Die goes where no travel book has dared to go before. Everyone knows about Carnival in Rio, but what about Carnival in Montañita, Ecuador, or Holi in India? Where are you going to find the most alcohol-saturated dance party on the planet? Is it Munich during Oktoberfest or Ibiza in the summer or someplace you may never expect like Tel Aviv? From classics like New Orleans at Mardi Gras to incredible off-the-beaten-path raves in Bogotá to unexpected festivals in Istanbul, 101 Places takes its partying seriously. Through hilarious (and ultra-useful) entries and stunning photography, it gives readers all the information (and inebriated inspiration) they’ll need to find the craziest clubs, the most isolated backcountry raves, and the most amazing festivals in places both iconic and underground. With writing by award-winning journalists from Matador Network—the world’s largest travel magazine—101 Places to Get F*cked Up Before You Die is the only travel guide that could possibly help adventure seekers and world-trekking party-goers take their experience to a whole new high (or low). So, raise a glass, hop a flight, and join 101 Places’ professional party-crashers as they breach security, ride ill-recommended ferries, and hike miles into the wilderness all in search of the best parties in the world.